In the following animations of stream flow, the thickness of river reaches varies with time as the function of the magnitude of the flow rate going through them. One can therefore see the flow waves propagating downstream. All these animations were prepared using 3-hourly outputs from RAPID. They can be played directly from this webpage (full-screen mode available) or downloaded in .avi, .flv and .mp4 formats. The latter can be uploaded to and played on iPhones. This first animation is of the San Antonio and Guadalupe Basins in Texas, USA, over four months (between 2007-06-01 and 2007-09- 30). 3-hourly surface and subsurface runoff was produced by the Noah-MP land surface model using a combination of NARR and NEXRAD for atmospheric forcing. RAPID was run at a 15-minute time step. Download .avi, .flv or .mp4. Or, play directly on YouTube. 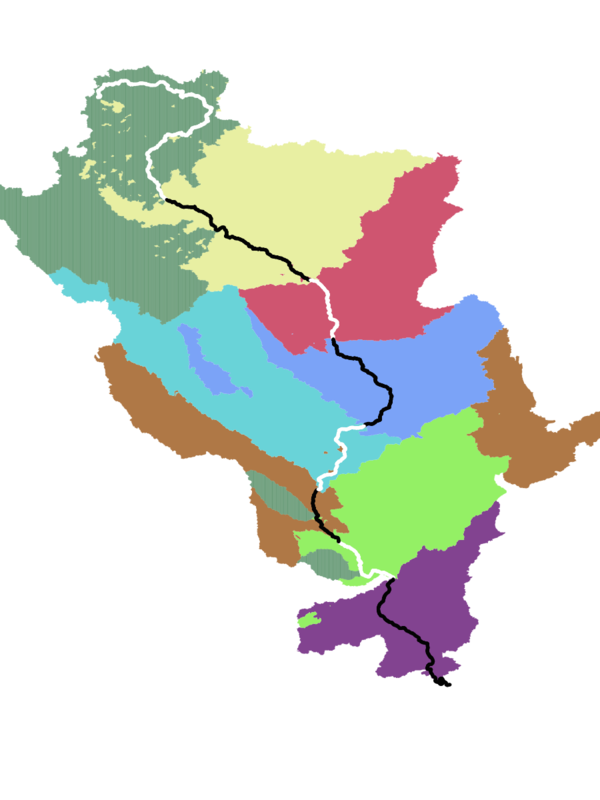 This second animation is of all the rivers in SIM-France, over four months (between 1995-12-01 and 1996-03-31). The computational domain of SIM-France covers all of Metropolitan France, including Corsica. Parts of Spain, Switzerland, Germany and Belgium are also included where their drainage area flows through France. 3-hourly surface runoff was produced by the ISBA land surface model using SAFRAN for atmospheric forcing. Daily exchanges between aquifers and rivers were computed by MODCOU. RAPID was run at a 30-minute time step. Download .avi, .flv or	.mp4. Or, play directly on YouTube. This third animation is of the Texas Gulf Coast Hydrologic Region, USA, over four months (between 2004-03-01 and 2004-06-30). 3-hourly surface and subsurface runoff was produced by the Noah-MP land surface model using NLDAS2 atmospheric forcing, and RAPID was run at a 15-minute time step. Download .avi, .flv or .mp4. Or, play directly on YouTube. This fourth animation is of the Upper Mississippi Basin, USA, over four months (between 2004-03-01 and 2004-06-30). 3-hourly surface and subsurface runoff was produced from hourly VIC data downloaded from NLDAS2, and RAPID was run at a 15-minute time step. Download .avi, .flv or .mp4. Or, play directly from YouTube. This fifth animation is of the river basins of California, USA, over four months (between 2005-11-01 and 2006-02-28). 3-hourly surface and subsurface runoff was produced byfrom hourly VIC data downloaded from NLDAS2, and RAPID was run at a 15-minute time step. Download .avi, .flv or .mp4. Or, play directly on YouTube. This sixth animation is of the Mississippi River Basin, USA, over four months (between 2008-04-01 and 2008-07-31). 3-hourly surface and subsurface runoff was produced byfrom hourly VIC data downloaded from NLDAS2, and RAPID was run at a 30-minute time step. Download .avi, .flv or .mp4. This seventh animation is of the Mississippi River Basin, USA, over four months (between 2008-04-01 and 2008-07-31). 3-hourly surface and subsurface runoff was produced byfrom hourly VIC data downloaded from NLDAS2, and RAPID was run at a 30-minute time step. Discharge computations were subsampled based on the expected SWOT orbit. Download .avi, .flv or .mp4.